Flea bites present with itchy, tiny, red bumps, usually on a person's ankles or arms. Although fleas are parasites of dogs and cats, they can jump up to 15 inches and bite humans. The first step in fighting a flea infestation is to treat your pet carrying the parasite. Cooking oil kills fleas in a safe, effective manner. Run a lukewarm bath, filling the tub or sink with just enough water to bathe your dog. Place a towel on a counter and set your dog or cat on the towel. Pour a small amount of cooking oil into your hands, and gently rub the oil into your pet's hair. Repeat the process until its coat is saturated in oil. Move your pet to the tub or sink. Shampoo and rinse as many times as necessary to remove all of the oil. Remove your pet from the bath and dry it off. Treat your house -- inside and out -- with pesticides to prevent reinfestation. Hiring an exterminator may be necessary for severe infestations. 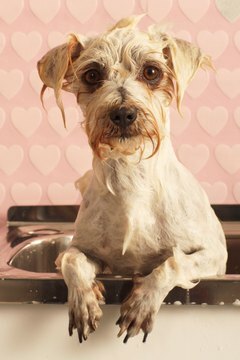 You may need help from a friend to complete the process if your pet is not keen on baths. A professional groomer is another option. Take care to avoid getting oil or shampoo in your pet's eyes.